Only one day in Split? This bustling Dalmatian city can seem overwhelming at first but with good planning it’s possible to soak up the best sights, cafes, restaurants and shops in one relaxed day. Start the day on Split’s alluring harborside promenade, Riva, where you can best appreciate Split’s medieval center tucked between the mountains and the sea. This pedestrian walkway is cool in the morning light. Pick up a city map in Split’s tourist office at Obala Hrvatskog narodnog preporoda 6 along Riva and then sit down for a leisurely coffee in Olive Tree, Obala Hrvatskog narodnog preporoda 6 Check out the beautifully frescoed interior. 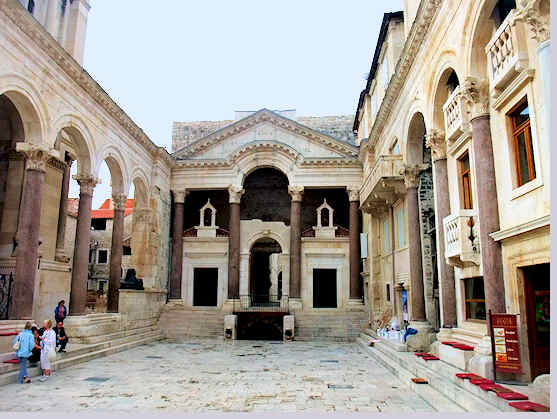 Head along Riva to Obala Hrvatskog narodnog preporoda 22 and enter Diocletian’s Palace through the cavernous basement halls, admiring the grandeur of the vaults and cupolas. The palace was built as a residence for Emperor Diocletian and then used as a summer residence for succeeding Roman rulers before being abandoned. Locals began moving into the walled residence in the 7th century and it has been continuously occupied up until the present day. Go to the end of the basement cellars and climb the stairs to the Peristil. Can you just imagine Emperor Diocletian in that central doorway (above)? It was constructed to frame His Majesty as he emerged from his private apartments. This ceremonial court is now a popular meeting place, lined with shops and often the site of street entertainment. Duck into the octagonal Cathedral of St Domnius built as Emperor Diocletian’s mausoleum. Amid the many artistic treasures within, note the frieze of the emperor and his wife, Prisca. 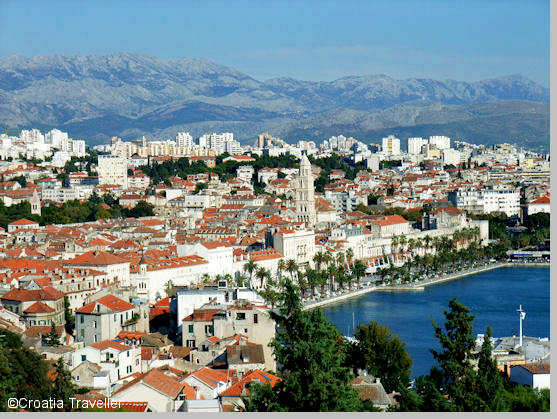 Climb the bell tower for a sweeping view of Split and the outlying islands. Back down on Peristil, stop in Atelier Perajica, a fascinating photographic studio that’s been in operation since 1949. 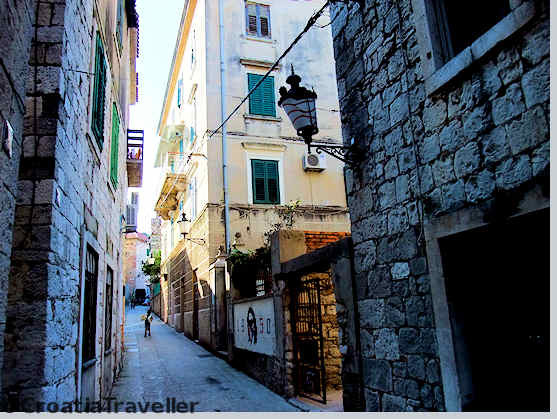 It’s a good place to view photos of old Split and pick up interesting souvenirs. From Peristil turn right onto Poljana Kraljice Jelene and leave the palace through the Srebrena Vrata (Silver Gate). Outside is Pazar, the Split outdoor market. Perhaps pick up some fruit for a snack? Or some local brandy? Locals come here to buy and sell their products from old clothes to homemade jam, wine or olive oil. 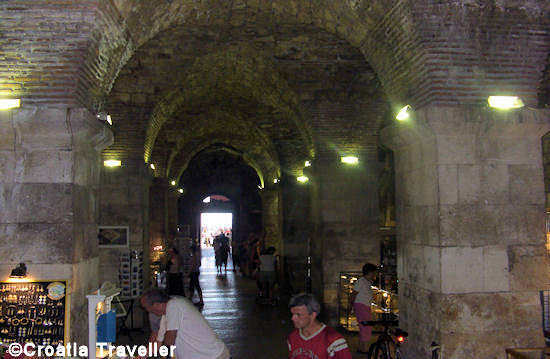 Re-enter Diocletian’s Palace again using the Silver Gate and keep going across using Kresimirova. 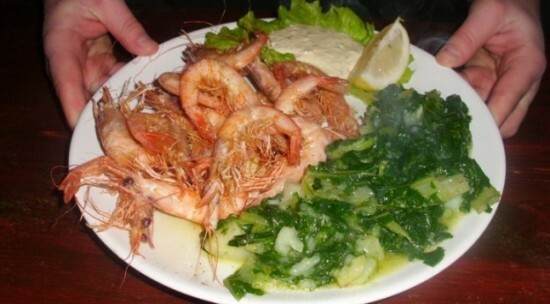 After Peristil on your right on Bajamontjeva is Konoba Trattoria Bajamont, the best place in Split for eating like a local. This tiny bar-restaurant cooks up fresh dishes daily, often drawn from the sea, and serves them to an enthusiastic crowd of regulars. After lunch, continue in the same direction and and leave the Palace through the Iron Gate. 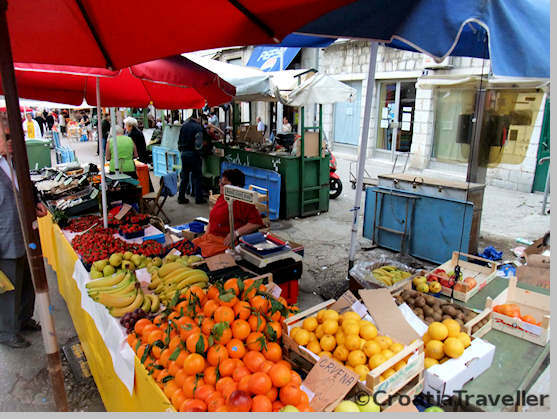 You’ll come to Narodni trg, which was the center of medieval Split. The oldest buildings are on the eastern side, most notably the 15th-century Romanesque Tower. Also on the square is the Ethnographic Museum, worth a stop for the mementos of Old Split which include embroidery, musical instruments and tools (closed Sunday). From Narodni trg take Zadarska, turn right on Obrov, follow your nose and you’ll come to Kraj Sv Marije, site of Split’s indoor Fish Market housed in a handsome Secession-style building. Head to the sea via the attractive pedestrian Marmontova, a wide boulevard of designer shops and jewelry stores. Cross Trg Republike and take Sperun, following it as it turns into Senjska which will take you through the Vari Varos neighborhood which was where the humble folks lived from the 17th century onwards. Today, it’s the site of much private accommodation. Climb the stairs of Senjska that ascend up forested Marjan hill, often called the “lungs of Split”. Stop for a coffee-and-cake break at Cafe Vidilica, a terrace bar popular with locals and drink in the fabulous views over the city and port. Explore the trails of Marjan Hill further or return via the same route. Split’s dining options are delightfully varied (see a selection of the best Split restaurants). 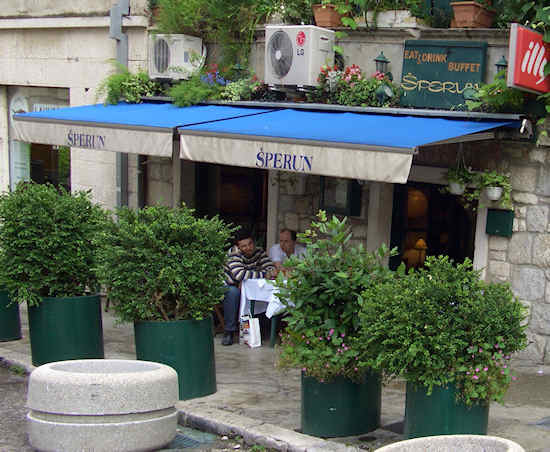 At the foot of Sperun is the restaurant of the same name, a reliable choice for reasonably-priced fish, meat and vegetable mains. Not far away on Trumbiceva 11 is casual Buffet Fife, perhaps a little self-consciously “local” by now but still a good place to get a fresh, filling meal. For a more elegant dining experience, return to the fish market and Nostromo for Split’s most scrumptious fish and seafood. After dinner, have a nightcap at relaxing Lvxor right on Peristil an only-in-Split kind of place that takes full advantage of Roman history in its stunning decor. Live jazz and occasional art exhibits draw a discriminating crowd. It’s easy to bar-hop within the walls of Diocletian’s Palace, or take a romantic seaside stroll to Split’s other nightlife center in Bacvice. See a selection of Split’s best nightlife. 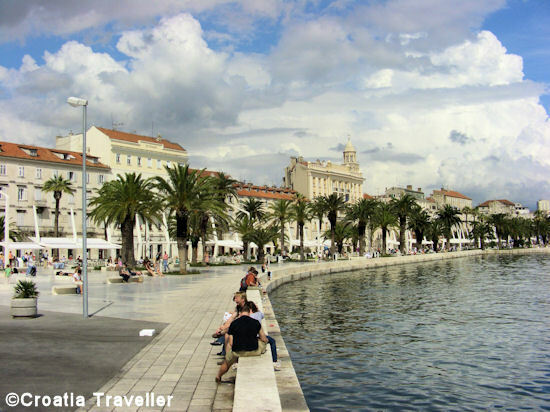 For other ideas, check out this Split walking tour, Split sightseeing, and this comprehensive Split guide.